Scorpion toxins may one day be useful as anticancer drugs. Venom from scorpions or honeybees sounds like it wouldn’t do a person much good. But by directing a modified component just to tumors, researchers might leverage it into a drug. Peptides in some venoms bind to cancer cells and block tumor growth and spread. But they have not yet been developed successfully as anticancer agents because they attack healthy cells too. Bioengineer Dipanjan Pan and coworkers at the University of Illinois, Urbana-Champaign, are now using polymeric nanoparticles to deliver venom toxin directly to cancer cells. 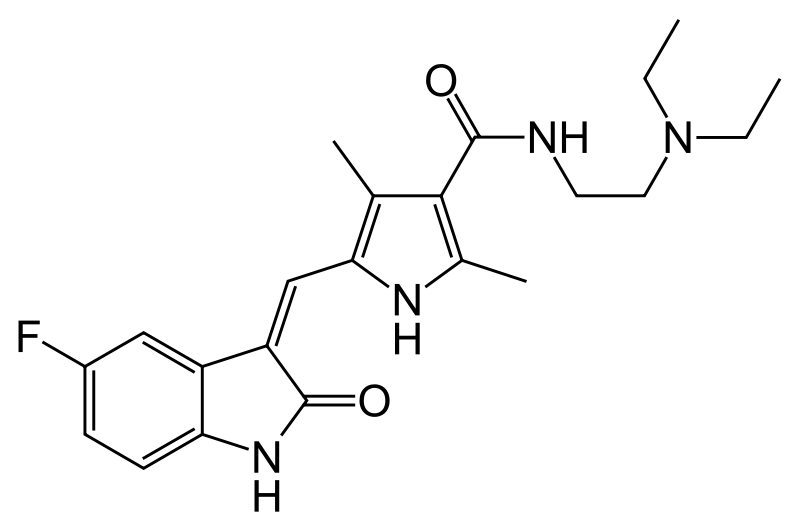 Sunitinib (marketed as Sutent by Pfizer, and previously known as SU11248) is an oral, small-molecule, multi-targeted receptor tyrosine kinase (RTK) inhibitor that was approved by the FDA for the treatment of renal cell carcinoma (RCC) and imatinib-resistant gastrointestinal stromal tumor (GIST) on January 26, 2006. Sunitinib was the first cancer drug simultaneously approved for two different indications. Feb. 8, 2013 — Findings from clinical trial patients with metastatic renal cell carcinoma, a common kidney cancer, show they did not have accelerated tumor growth after treatment with sunitinib, in contrast to some study results in animals. Sunitinib is one of several drugs, either on the market or undergoing testing, that target blood vessel growth. There had been debate, based on the animal studies, about whether tumor blood vessel changes induced by these drugs promoted tumor growth and/or caused cancer to spread. In this study, Tito Fojo, M.D., Ph.D., head of the Experimental Therapeutics Section, Medical Oncology Branch and Affiliates, NCI, and his colleagues, found that not to be the case. Results of their study appeared in Cell Reports, Feb. 7, 2013. Using a mouse model to assess small, relatively newly developed tumors can be much more challenging than assessment in humans who tend to have more established tumors several centimeters in size. To address whether sunitinib accelerated tumor growth in humans, researchers analyzed data from a randomized phase III trial comparing sunitinib with interferon alfa in patients with kidney cancer. Using a novel methodology for assessing efficacy , they found sunitinib reduced the tumor’s growth rate while improving survival, without appearing to negatively alter tumor biology after discontinuation. Their findings suggest that concerns arising from animal models may not apply to patients receiving sunitinib and most likely will not apply to patients using similar agents, but recognize more studies may need to be done. SUTENT, an oral multi-kinase inhibitor, is the malate salt of sunitinib. Sunitinib malate is described chemically as Butanedioic acid, hydroxy-, (2S)-, compound with N-[2-(diethylamino)ethyl]-5-[(Z)-(5-fluoro- 1,2-dihydro-2-oxo-3H-indol-3-ylidine)methyl]-2,4-dimethyl-1H-pyrrole-3-carboxamide (1:1). The molecular formula is C22H27FN4O2 • C4H6O5 and the molecular weight is 532.6 Daltons. SUTENT (sunitinib malate) capsules are supplied as printed hard shell capsules containing sunitinib malate equivalent to 12.5 mg, 25 mg or 50 mg of sunitinib together with mannitol, croscarmellose sodium, povidone (K-25) and magnesium stearate as inactive ingredients. The orange gelatin capsule shells contain titanium dioxide, and red iron oxide. The caramel gelatin capsule shells contain titanium dioxide, red iron oxide, yellow iron oxide and black iron oxide. The white printing ink contains shellac, propylene glycol, sodium hydroxide, povidone and titanium dioxide.